I fancied a bit of a change this week. I’ve been channeling the coral nail trend for the last couple of Summers and I got a bit bored. Even pastel colours weren’t enough to satisfy my colour craving… they just weren’t doing it for me. Off I trotted to Superdrug to have a look at what inspiration I could get to inject some life into my colour palette and where better to start than the Barry M counter? If you need a bit of je-ne-sais-quois in your make-up bag then Barry M always delivers, even if sometimes a bit too much… you can end up looking like those hideously-over-done-mish-mash-of-1980s-make-up girls in the advert if you’re not careful! Don’t get carried away though, opt for one striking colour and leave it at that. So what was on the radar this week? Green nail varnish. Yup, you heard me correctly, green nail varnish. I opted for Spring Green, a very vibrant apple-esque shade that’s bound to create an impression. What I like about Barry M nail varnish is that it’s not only super bargainous (and always on offer… two for £5 – yes please!) but it actually turns out the colour you’d expect from looking at the bottle. Many times before I’ve purchased a lush colour, gotten home super excited and slapped some on my talons, only to find it’s actually nothing like what I expected. 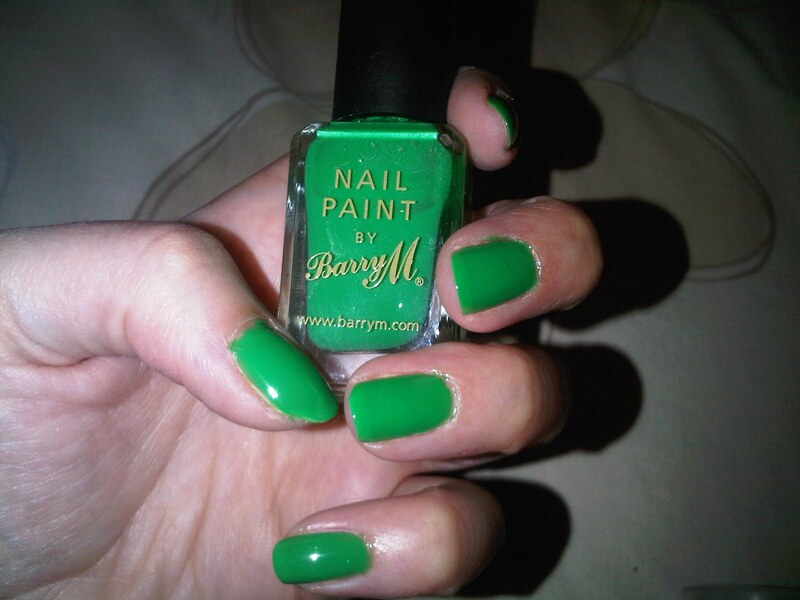 Barry M always delivers – great colours that last and only need two coats. Not only does Spring Green look fab, it’s super on-trend too. It’s been seen gracing the hands of many a celeb in the last few weeks, including Lily Allen, Lauren Conrad and my fave style icon Fearne Cotton at the Isle of Wight Festival. If it’s good enough for Fearne then it’s good enough for me.